There are now a large number of preserved buses and coaches from the West Midlands of the United Kingdom. These vehicles are owned and taken care of in a number of ways. Usually either by private individuals, enthusiast groups or museums. The midlands are well represented for transport museums. On this DVD programme, featuring preserved buses, we pay a visit to ‘The Transport Museum’ at Wythall in the West Midlands. The programme is divided into three parts. 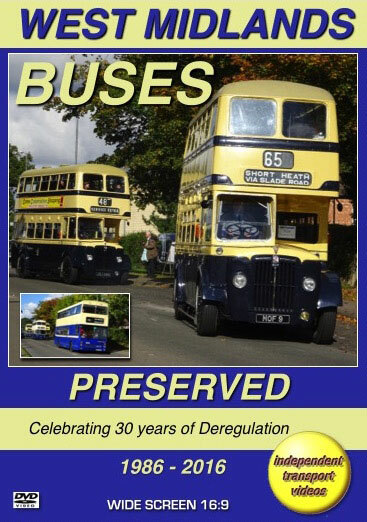 In the first part we feature an event organised by The Transport Museum at Wythall to celebrate 30 years of bus deregulation that took place on the 26th October 1986. The event was held at the museum on Sunday 9th October 2016, where around 40 buses were operated on a special route from the museum to the Maypole and then shuttling between Maypole and Becketts Island on Alcester Road. Our cameras began the day at the museum and boarded Birmingham Corporation 2976 (JOJ 976), a beautifully restored Guy Arab IV with Metro-Cammell bodywork on route 750 to Birmingham city centre. We travel to the city on the lower deck to hear the sounds of the Gardner engine with pre-selector gearbox providing the ‘music’, and return to the Maypole on the upper deck reliving the days of a bygone era. Alighting at the Maypole we record the action! The event was segmented into a different transport ‘Happy Hour’ as the organisers put it! The first was the ‘Corporation’ hour celebrating the undertakings that formed the West Midlands PTE in 1969. The second hour was the 1970/1980s with the vehicles that were operated by WMPTE across Birmingham, Black Country and Coventry. The third was the post deregulation area, were we see vehicles in Travel West Midlands liveries, and finally into the late 1990s with the introduction of low floor buses and the red and white livery. During this intense running activity we travel back to the Museum onboard former Walsall Corporation 116 (XDH 116G), a ‘short’ Daimler Fleetline CRG6 with Northern Counties bodywork for a couple of ‘shuttle’ runs passing the other vehicles of the same service. From the Museum we travel back to the Maypole on WMPTE 4738 (JOV 738P), a Volvo-Ailsa with Alexander bodywork to continue filming the action. We conclude the day with some footage at Alcester Road, Wythall and at the Museum as the vehicles are parked up or leave for their respective homes. The second part of this programme feature two former Coventry Transport preserved buses at the ‘Buses’ magazine event at the British Motor Museum at Gaydon, Warwickshire in August 2016. They are double decker 334 (334 CRW), a Daimler CVG6 with Metro-Cammell bodywork and single decker 244 (EVC 244), a Daimler COG5/40 with Park Royal bodywork. We travel on both vehicles on the Kineton ‘Circle’ route from the museum along the roads and lanes of Warwickshire providing beautiful views and excellent sounds! The third and final part to this DVD programme is on board a ‘Wythall’ owned vehicle. A Midland Red D9 double decker, 5399 (BHA 399C) on a circular journey from the museum to Henley-in-Arden and back. Filmed in March 2016 we can savour the lovely sounds and beautiful views as we travel on this interesting bus.